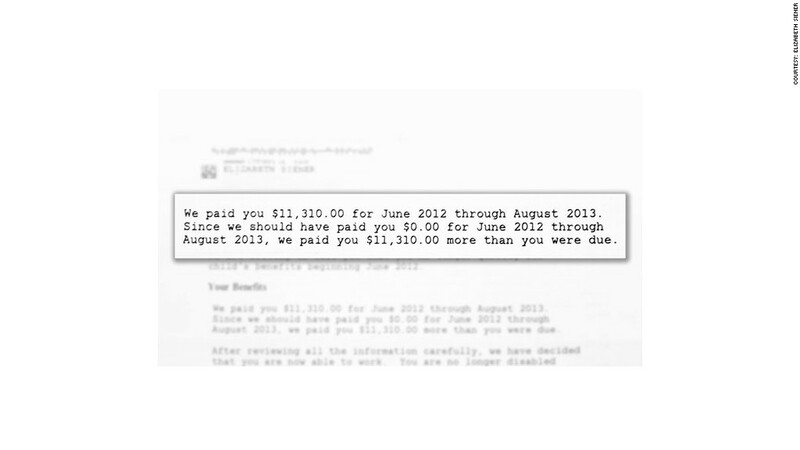 Elizabeth Siener was shocked by a notice from Social Security asking her to repay more than $11,000. The Social Security Administration is overpaying big sums of money to disability beneficiaries -- and lawyers, consumer advocates and watchdogs say the agency's own missteps are to blame. Long after notifying Social Security that they have either started working again or earn too much income to qualify for benefits, some disability recipients continue to receive payments for months or even years. It's not until a notice from Social Security shows up that they discover they now owe tens of thousands of dollars to the agency due to these overpayments. "Social Security is very quick to say [these overpayments are] all fraud and abuse," said Cheryl Bates-Harris, who runs the Social Security program at the National Disability Rights Network, which helps disability beneficiaries return to work. "It doesn't want to admit it's culpable, so it throws the responsibility on the beneficiaries... but there are critical failures within its system." The Government Accountability Office, which oversees the Social Security Administration, says that budget constraints and huge backlogs of people applying for disability have delayed the reviews of income information that alert the agency to remove beneficiaries who no longer qualify. As a result, the Social Security Administration has made $1.3 billion in overpayments in just two years, according to a recent GAO audit. Some of that has gone to fraudsters, while other payments have been improperly doled out to innocent people who don't realize they are being overpaid or have tried to stop the erroneous payments. "We think that they need to devote more resources to this," said Steve Lord, director of forensic audits and investigative services at the GAO. "Right now getting people off the [disability] rolls is secondary -- they have to balance their resources between getting people off the rolls and getting people on the rolls." While the Social Security Administration said its accuracy rate is nearly perfect, it acknowledges that funding has been an issue. The agency said it has lost more than 11,000 employees since 2011. At the same time, its workload has been increasing as baby boomers near retirement and enter "their disability prone years," a spokeswoman said. "[O]ur administrative budget has been significantly reduced, resulting in three straight years of funding levels nearly a billion dollars below the President's budget requests," a spokeswoman said. "We have had to prioritize our workloads given our limited budget and resources." The administration said it will investigate any potentially improper payments that the GAO identified. Receiving a request for repayment can deal a serious financial blow to some people. "[Social Security] doesn't see [an overpayment] as a crisis, but for an individual who gets a notice saying they owe something like $40,000, that's enough to cause a lot of heartache," said Suzie Miller-Schoen, an advocate at Disability Rights Nebraska. That's what happened to Elizabeth Siener, from Massachusetts, who has a severe bipolar disorder. She began working in the summer of 2012 and continued receiving checks for another year. When she notified the agency, they told her the payments weren't a mistake because she had been underpaid during a previous year. But then Social Security asked for all of the money back. Siener, who is appealing the request, has already spent all of the money on living expenses (she makes less than $40,000 per year) and has little left in her savings. She's now worried the agency will go after her account. 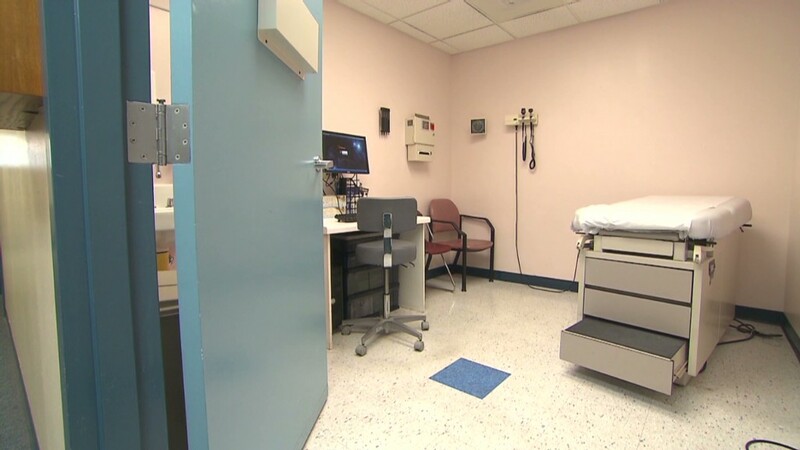 "What is so frustrating is not just the fact that getting an overpayment throws them into turmoil financially, for some of the people their main disability is anxiety and depression so this renders them almost incapable of working," said Miller-Schoen. What to do: If you believe you weren't overpaid or suspect the overpayment amount is incorrect, you can request a reconsideration from Social Security. If you agree that you were overpaid but believe the overpayment wasn't your fault, or if you don't have the means to repay the money, you can request a waiver. You can also file for both options if applicable, and you're able to appeal any decision that is made. But an appeal is often a very lengthy process if you don't have anyone to help you, attorneys say. If Social Security determines you still owe the overpayment, it will work out payment plans based on income. But if you fail to pay, it can withhold a portion of future benefits until the overpayment is recouped. It is also able to confiscate tax refunds and garnish your wages if you aren't receiving benefits anymore, and the debt can be reported to the credit bureaus. If you know you're being overpaid, don't ignore any notices you receive and make sure to keep the extra money in a separate account until you get everything worked out with the agency. To avoid an overpayment in the first place, make sure to report a new job or change of income to the Social Security Administration immediately. But even if you do everything right, it can still be out of your hands. "These are the vulnerable people of our society that this system is set up to assist, but sometimes the system turns it around and these people become victims," said Lord.